It’s an annual sight at the state capitol: California lawmakers scrambling right up until midnight to meet the end of session deadline for legislation. This year was no different as more than 200 bills were debated on the final day’s agenda. Hundreds more weaved their way through the capitol in the days leading up to that point. By the time the final gavel fell, the legislature had approved about 900 bills. Some wound up vetoed by Governor Brown as he made his last pass at reviewing potential laws in California. 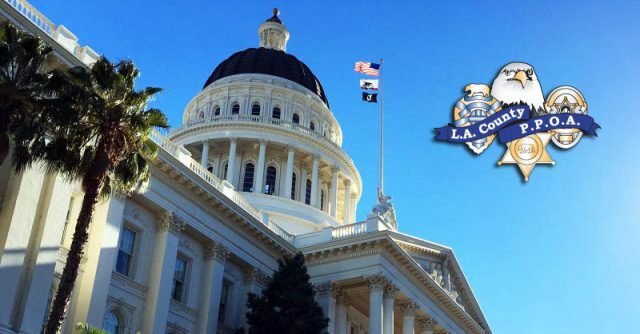 Through it all, PPOA lobbyists were actively seeking passage of bills we sponsored or supported, while simultaneously seeking to defeat legislation that would adversely affect law enforcement personnel. Your union’s commitment to the legislative process stretches back more than three decades and has greatly impacted the rights and benefits of thousands of PPOA members. This measure would designate a specified portion of Interstate 105 in the County of Los Angeles as the Los Angeles County Sheriff’s Deputy Didier M. Hurdle Memorial Highway. The measure would also request the Department of Transportation to determine the cost for appropriate signs showing this special designation and the badge of the Los Angeles County Sheriff’s Department and, upon receiving donations from non-state sources covering that cost, to erect those signs. SB 699 would end the disparity that currently exists within Government Code Section 3301 by including coroners and deputy coroners (who are peace officers) within the description of public safety officers who are covered by POBAR. It cleans up a gap in current law. Currently, peace officer coroners and deputy coroners who are part of a county sheriff’s agency are covered by POBAR. However, peace officer coroners who perform the precise same functions, but are in a free-standing Coroner office, are not covered by POBAR. Including these peace officer coroners and deputy coroners under the aegis of POBAR is not only sound public policy, it is a quantified minor change. Statewide, this change will only place approximately 66 or so additional peace officers under the rubric of POBAR. This bill is needed because there have been a number of dysfunctional parole dates given to persons sentenced to a life term in state prison; Panels of the Board of Parole Hearings have awarded ten parole dates to cop killers since January 1, 2014. SB 1242 would codify the standards the Panel must determine by using new factors prior to granting a parole date to an inmate. Would state that an employer, at its discretion or in accordance with specified policies, is not precluded from accepting liability for compensation for an injury sustained by a peace officer by reason of engaging in the apprehension or attempted apprehension of law violators or suspected law violators, or protection or preservation of life or property, or the preservation of the peace, outside the state of California, but who was not at the time acting under the immediate direction of his or her employer, including any claims for injuries sustained by peace officers during the October 1, 2017, mass shooting in Las Vegas, Nevada, if the employer determines providing compensation serves its public purposes. This bill would authorize a county retirement system in Los Angeles County to correct a prior board decision determining the effective date of retirement for a member permanently incapacitated for disability that was made between January 1, 2013, and December 31, 2015, and was based upon an error of law existing at the time of the decision, as specified. The bill would authorize a member seeking correction under these provisions to file an application with the board no later than one year from the date these provisions become operative. Current law makes it a crime for a person to destroy, cut, mutilate, deface, or otherwise injure, tear down, or remove any tomb, monument, memorial, or marker in a cemetery. Existing law makes it a crime, punishable as a felony or a misdemeanor, to maliciously destroy, cut, break, mutilate, efface, or otherwise injure, tear down, or remove any veterans’ memorial constructed or established in specified ways. Current law makes it a crime, punishable as a felony or a misdemeanor, to maliciously destroy, cut, break, mutilate, efface, or otherwise injure, tear down, or remove any law enforcement memorial or firefighter’s memorial. This bill would specify that the provisions above regarding law enforcement and firefighter’s memorials do not preclude prosecution under any other provision of law, including those regarding veterans’ memorials.